I took a trip to James York’s Minecraft world to see how his immersive Japanese language learning world is coming along. I love James’ approach and where he is going with his Minecraft world. James is a big advocate of a holistic approach to teaching Japanese. 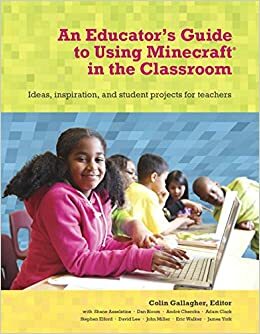 Thinking of the connections to the world at large and creating areas in Minecraft for his students to interact and immerse themselves in the Japanese language is what his Minecraft world is all about. I mention in the video that I’m a little bitter that after 18 years of learning Irish in a rote memorization curriculum I remember about 5% of the Irish language (at a stretch). If only in my time at school I was taught in the same way James teaches his students. What did I really need to learn when learning Irish? In what context? Minecraft wasn’t around in those days but I should have been immersed in the language in the context of everyday life (role-playing, skits, how-to demonstrations). All those things are being transformed in modern day activities within Minecraft by James. I look forward to re-visiting James at a later date. Great idea, I learn when driving already. Now I can learn in the heat of adventure!